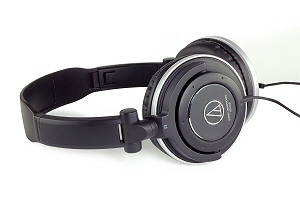 The Audio-Technica SJ5 DJ style headphones. These portable headphones deliver exceptional sound alongside DJ style mobility. The SJ5 headphones are designed with swivel housing and one-ear monitoring – each ear piece is designed to turn 90 degrees horizontal and 180 degrees vertical. With sophisticated driver technology and superior components, the headphones allow very high SPL capabilities whilst maintaining exceptional sound clarity and a wide frequency response for fuller, richer sound. The SJ5 headphones are designed for maximum long wearing comfort with leather earpads and a sturdy headband. Compact and stylish and available in black. The ATH SJ5 headphones come supplied with a 1.2m cord and are suitable for any audio player with a headphone output.